This is actually an outfit from the "7 Pieces 7 Ways" post that I did back in June. 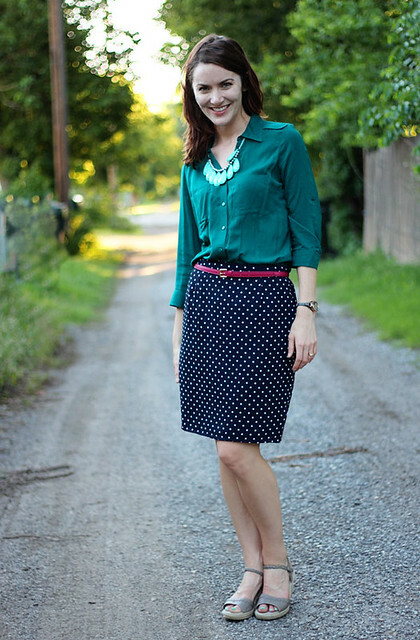 I love thinking of new ways to wear clothes I already have, so that has definitely become one of my favorite posts. I can stand in front of my closet every morning and feel like I have nothing to wear (I know I'm not alone in this), but the truth is that there are so many combinations of clothes that I haven't tried yet. And I don't even have that many clothes! (You can see my closet here). So my new strategy is to play dress-up. I'll spend one evening every few months just trying on different outfit combinations and then taking pictures on my phone to remember them. It's actually working really well so far. Do you have any strategies to think of new ways to wear clothes you already have? I really need to try playing dress up to find new outfits in my closet! Great idea. I love this outfit! I actually just did a 7X7 post today! It was kind of challenging, but what I discovered is taking some time to do this really helps me to shop my closet better. I think I'll set aside some time to really do this with my whole closet. 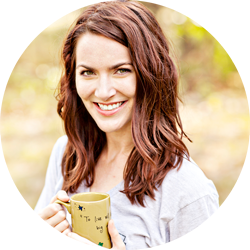 I just joined go chic or go home so I figure that will help me keep it organized and remember it all! I think some of my best outfits come out of thinking what 2 or 3 pieces will work in my head. Then I put them on and Viola; they actually DO WORK! I have an almost identical Pencil Skirt. I will remember to pair it with emerald. I definitely do this a lot. I like to make small adjustments to wearing something in a similar style with different colors. Or keeping the colors the same but with different pieces. I also feel that just switching my shoes or adding a scarf can make a huge difference even if I keep everything else the same. I can see that strategy working, but I hate actually trying on clothes. Every time I do laundry, when I'm putting my clothes away, I try to switch up the stacks in my cupboard so I can see what I haven't worn recently, that helps me with variety! Love this outfit! Especially the blouse and the necklace! That's such a great idea to come up with combinations and take pictures with your phone. I really love your green top and necklace together!! I like how the pink belt adds a pop of brightness to this outfit. And yes, I'm always thinking of news combinations- how to mix and match clothes to get maximum use out of them. Adorable skirt! I love your necklace!!!!! it's kind of magical how many combinations a person can come up with with just a limited number of pieces. I love the one piece many ways challenge for that reason too. Having a lot of clothes stresses me out because I'm worried I can't wear any of them enough to justify having them. I always find it a lot easier to figure out what I'm going to wear when I'm on vacation or away from home because there are a lot less options! I get so excited when I come up with a new combination! I have been meaning to spend a Saturday afternoon (because my husband is busy studying) coming up with new ideas and taking pictures, but I haven't yet. I also need to organize my closet... maybe next weekend! Love this look! Beautiful outfit! 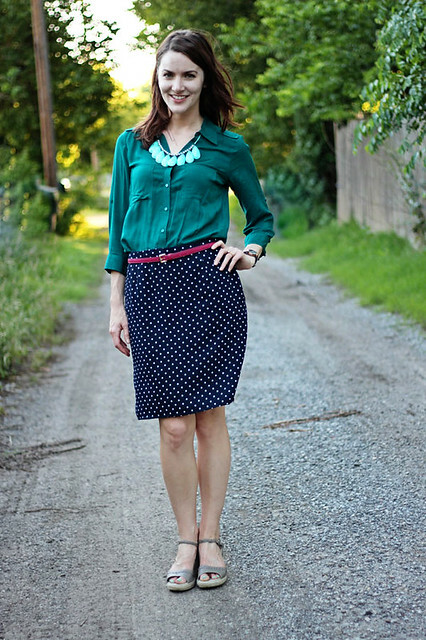 I adore the polka dotted skirt and the pop of color with your belt and necklace. Such a great outfit! I love the necklace! Great outfit!! And I love trying new combinations of my existing wardrobe. The best. very cute! I am always a fan of polka dots. I'll do the same thing. The other trick I've used lately is having a bunch of clothes in one area (bathroom, desk chair, etc) and then somehow two things will end up looking good together, e.g., blue button up and crazy crops. 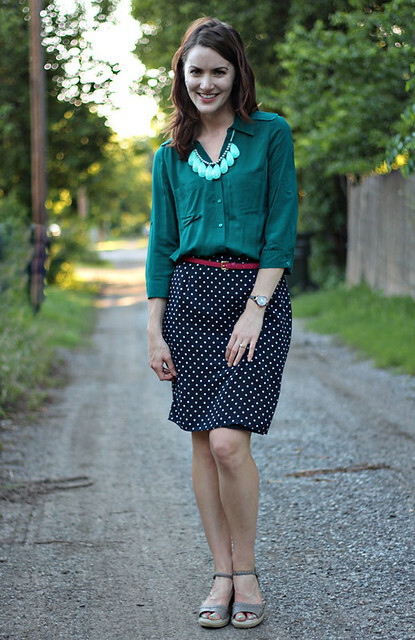 I like this look, and especially the way the necklace and shirt are similar in color, but not the same. I think I need to order that skirt from Forever 21 RIGHT NOW! This outfit is gorgeous, as are you lady! Love your look, especially your skirt. Great addition to your closet.